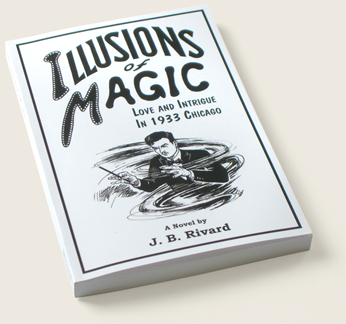 This edition is written as we celebrated the publication of Illusions of Magic with a great party. See “A Publication Celebration” below. Most of us enjoy humor, especially in our reading. James Thurber wrote a number of funny stories, but My Life and Hard Times certainly heads the list. My comments about that book are in “Cranky Cars and a Jittery Genius,” below. Don’t forget you don’t have to have an e-reader (Kindle, Nook, etc.) to read the $2.99 eBook version of Illusions of Magic. There’s a FREE app on Amazon (below the book cover) that allows you to read on many devices—an ipad, iphone, computer, etc. Also below, as usual, is “Wisdom with a Smile”, a few less-than-serious items to lighten your day. I hope you enjoy the blog. Please take time to comment, about the website, the blog, or any other topic. (Be sure to tell me who it’s from.) Simply send an email to: feedback@illusionsofmagic.com. As the year 1933 opened and the Great Depression deepened, book readership bloomed. The Werewolf of Paris was an April bestseller, echoing today’s vampire craze. The next month, White Collar Girl, by Faith Baldwin, became a circulation leader among women readers. The faltering economy forced Everyman’s Library to reduce its book prices from 90 cents to 70 cents, yet many could still not afford them. Popular alternatives included public libraries and the now-extinct bookstore rental libraries. James Thurber’s My Life and Hard Times was first published that year. Nominally an autobiography, it relates a series of unlikely happenings of his eccentric family and other residents of Columbus, Ohio, during his youth. It is now considered a classic. In its preface, Thurber describes his trepidation at writing: “At forty my faculties may have closed up like flowers at evening, leaving me unable to write my memoirs with a fitting and discreet inaccuracy…” Yet this slim volume remains a work of genius, reporting as it does on a grandfather who regularly relives the Civil War, a mother who believes the Victrola may at any moment explode, and a grandmother who fears, if a wall switch is left on, that electricity will leak out of empty sockets into the house. In one episode, Thurber writes of his father’s old car, “Once, we had been able to start the engine easily by cranking it, but we had had the car for so many years that finally it wouldn’t go unless you pushed it…” Pushing occasionally required five or six men, and always a nimble foot on the clutch to avoid stalling the Reo’s engine after it started. At chapter’s end the car is destroyed in an accident, prompting grandfather to claim his son had initially purchased the wrong make of automobile. Such car problems put me in mind of Nick’s experience in Chapter 15 of Illusions of Magic, as he surveys the house on Rhodes Avenue from his parked car. It’s dark and cold, and his old car’s heater has once again quit. As the hours wear on, his feet grow ever colder, and wiggling his toes only proves his shoes feel like “icy steel.” Stomping his feet on the floorboards, he wonders if frostbite is a risk. Writers love cranky cars. They make great subjects for stories. It came lumbering out of the distance, then closed with a magnificent roar. It disappeared into the distance and became visible again only as it taxied toward us after landing. That huge sound, so different from the scream of today’s jet airliners, comes from the four radial engines on its wings that together develop about 10,000 horsepower. These 18-cylinder mechanical marvels drive massive four-bladed propellers enabling this heavy machine, loaded with bombs, to cruise at high altitude at more than 200 miles per hour. It was the most technologically advanced bomber of the era. We had to crouch, then move forward through the radio, engineer’s and navigator stations. Care was needed to avoid the dense tangle of ducts, cables, and braces. Ahead, we stepped down toward the pilots’ seats, sun streaming in through the curved windows of the nose. In front of, and below the two pilot seats was the heart of the machine—the bombardier’s station. It was there, I remembered, where 1st Lieut. Paul O’Brien had been when his world instantly changed. While I was a staff member at the Lab, Paul was one of my supervisors. He walked with an obvious limp, and by habit often massaged his left leg with his hand. That was because, on that bomb run in January 1945, a shell fired from an anti-aircraft gun on the Japanese mainland blew a hole in the nose of his B-29 and nearly severed his leg below the knee. With that, and gashes and shrapnel tears elsewhere, it was all he could do to remain semi-conscious. An icy gale burst at him through the hole in the nose. But fortunately, the plane was able to continue flying. When it finally returned to base, the nearly-frozen Lieutenant was quickly removed to the hospital. That sub-zero air blasting through the nose had frozen his wounds, preventing him from bleeding to death. We were part of the group touring a restored B-29 named Fifi. 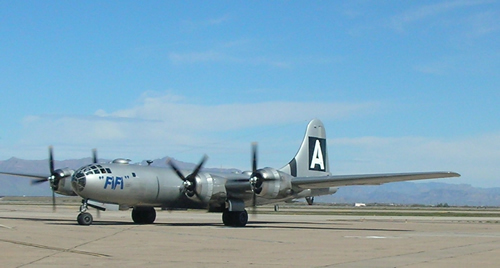 Despite the nearly four-thousand B-29s built during the war, Fifi remains the only B-29 Superfortress now flying. The magnificent roar of those thundering bombers notwithstanding, that campaign could not have succeeded except for the skill and bravery of people like Paul O’Brien. On May 17 we celebrated the publication of Illusions of Magic on Amazon.com. The eBook went on sale a month earlier priced at $2.99, and was almost immediately accorded a five-star rating by early purchasers. The celebration was held in the ground floor rooms of the Patsy Clark Mansion (see illustration). Irish immigrant Patrick ‘Patsy’ Clark made his fortune in mining in the Western U.S. during the last quarter of the 19th century. He hired Kirkland Cutter to design a luxurious 3-story, 12,000 square-foot home in Spokane that took nine years to complete. The exterior, of imported sandstone and brick, with rounded towers, is Spanish or Moorish in appearance. 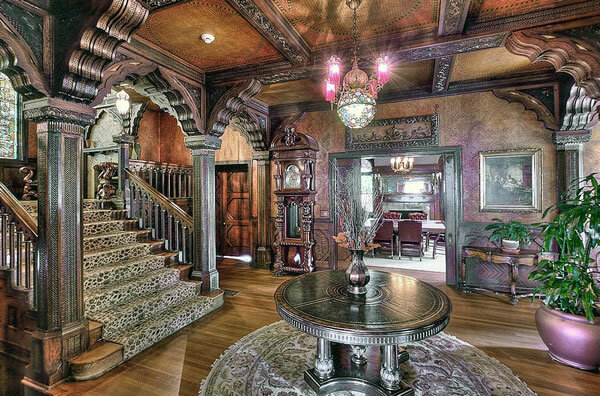 Its twenty-seven rooms are each of unique design and origin, with detailed woodwork, ornate fireplaces, and exotic wall coverings. The building has been restored and is on the National Register of Historic Places. The celebration was attended by a large crowd of invited guests, including representatives of firms contributing to the launch of the book and the website. They were treated to catered hors d’oeuvres and drinks, with live music by Pamela Benton. Some other strange definitions include Ambiguity: the lack of clarity in speech, maybe. How about Lobster: someone who throws poorly? I just watched my neighbor’s dog chase its tail for ten minutes and thought to myself, “Wow. Dogs are easily entertained.” Then I realized I just watched my neighbor’s dog chase its tail for ten minutes. As a teen, one of my favorite tunes, sung by Nat ‘King’ Cole and others, was “It’s Only a Paper Moon.” I’ve always considered the lyric’s references to a muslin tree, a cardboard sea, a canvas sky and other carny gear in the context of a love song both clever and touching. The Internet credits the song to the 1933 Paramount movie “Take A Chance.” But as is often true, that’s not the whole story. In 1932, Producer Billy Rose staged “The Great Magoo,” a comedy written by Ben Hecht and Gene Fowler. The plot concerns some Coney Island carnival types; the “magoo” here is slang for a carnival ‘dancehall girl,’ while Sam McMurray is a barker and (unlikely) a songwriter. Despite Arlen’s delightful melody set to Yip’s lyric, titled at the time “If You Believe In Me,” the play didn’t please the critics and closed after eleven performances. In the movie “Take A Chance,” a pickpocket falls for the flaxen-haired heroine. In this film version of the Broadway musical comedy, Lillian Roth sings the same song from “The Great Magoo” of 1932, now retitled “It’s Only A Paper Moon.” Although the film moved speedily and its squad of lithe and graceful girls dancing in the footlights were applauded vigorously by an on-screen audience of Hollywood extras, the movie flopped. Regardless of the year of its origin, Harold Arlen and Yip Harburg’s bubble-light Paper Moon continues to sail over that cardboard sea. And in my make-believe world it continues on and on, into the foreseeable future.